We are studying the ancient Assyrians in co-op. They were such a fascinating warlike people that did a lot of conquering and killing. However, they did create some pretty amazing art and much of their history directly intersects with Israel's history. You can find some neat up close and person art/history/geography lessons about them on Khan Academy and I link to a few videos below. I highly recommend you watch them! If any of my readers read the Bible (and I am guessing quite a few of you do!) this will be of interest to you. Ashurbanipal Hunting Lions, gypsum hall relief from the North Palace, Nineveh. 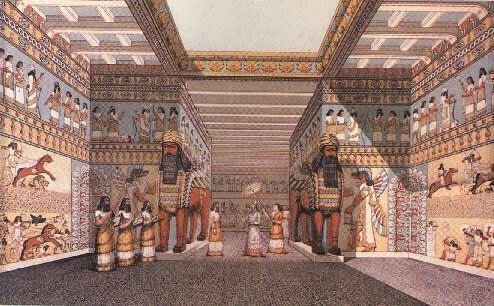 This is an artist's view of what ancient Nineveh would have looked like. That is what Jonah would have walked into--where God sent him to preach against their sin. It gives you a better idea of why he chose the whale. God sometimes asks us to do hard things, doesn't He? Assyrian Human Headed Winged Lion and Bull (Lamassu). These winged lion/bull/kings are over ten feet tall. If you ever get a chance to see one - go do it! In 722 BC, the Assyrians conquered Israel. The Assyrians were aggressive and effective; the history of their dominance over the Middle East is a history of constant warfare. In order to assure that conquered territories would remain pacified, the Assyrians would force many of the native inhabitants to relocate to other parts of their empire. They almost always chose the upper and more powerful classes, for they had no reason to fear the general mass of a population. They would then send Assyrians to relocate in the conquered territory. So here is one of the more fascinating twists in history for you! 27 Then the king of Assyria commanded, saying, “Take there one of the priests whom you carried away into exile and let him go and live there; and let him teach them the custom of the god of the land.” 28 So one of the priests whom they had carried away into exile from Samaria came and lived at Bethel, and taught them how they should fear the Lord. 29 But every nation still made gods of its own and put them in the houses of the high places which the people of Samaria had made, every nation in their cities in which they lived. Isn't that interesting? So now you know why the Samaritans had such a messy faith and why the "pure" Jewish leaders disliked them so much. I love the study of the ancients, but I really love it when it intersects with my faith in some way. These were real people - people that walked away from the God of the universe - and they were lost forever. We have this time, right now, to know our Lord! As Romans 5:8 so beautifully states, "But God demonstrates His own love toward us, in that while we were yet sinners, Christ died for us." I don't want to be an Israelite lost forever. What a terrible terrible fate. Terrific post, Katie. Thank you! I, too, am fascinated by the link between the Bible and ancient history..... We could spend hours discussing our history lesson when we discover a connection between it and our Bible reading! I'm sure your kids could as well..... Love this, thank you.